Gómez-Roblesa, Aida, José María Bermúdez de Castroc, Juan-Luis Arsuaga, Eudald Carbonelle, and P. David Polly. A central problem in paleoanthropology is the identity of the last common ancestor of Neanderthals and modern humans ([N-MH] LCA). Recently developed analytical techniques now allow this problem to be addressed using a probabilistic morphological framework. This study provides a quantitative reconstruction of the expected dental morphology of the [N-MH]LCA and an assessment of whether known fossil species are compatible with this ancestral position. We show that no known fossil species is a suitable candidate for being the [N-MH]LCA and that all late Early and Middle Pleistocene taxa from Europe have Neanderthal dental affinities, pointing to the existence of a European clade originated around 1 Ma. 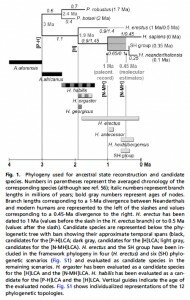 These results are incongruent with younger molecular divergence estimates and suggest at least one of the following must be true: (i) European fossils and the [N-MH]LCA selectively retained primitive dental traits; (ii) molecular estimates of the divergence between Neanderthals and modern humans are underestimated; or (iii) phenotypic divergence and speciation between both species were decoupled such that phenotypic differentiation, at least in dental morphology, predated speciation. This paper uses slow-changing and genetically determined dental traits to make two important observations: a) the last common ancestor of humans and Neandertals cannot presently be established; b) contra Eric Trinkaus, Neandertal dentition is not primitive with respect to modern human dentition; c) molecular clock has made the divergence of humans and Neandertals appear much too recent. Fig. 1 on the left shows the disparity between two age estimates – 450YBP (genetics) and 1MYA (paleontology). 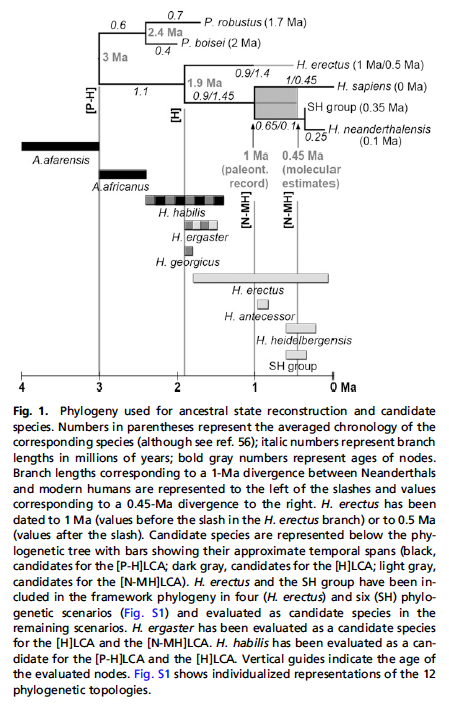 Conclusions (a) and (c) are very robust: while earlier phylogenetic nodes are very robust, none of the tested fossil species came anywhere close to Neandertals or modern human dentition and the paleontological dates are all outside even the widest confidence intervals associated with the molecular divergence dates. Conclusion (b) is very robust under the assumption of neutral evolution, for which the authors believe there is ample dental and cranial evidence. But their dental evidence for the derived nature of Neandertal dentition comes from postcanine (posterior) dentition only. It is indeed known that Neandertal posterior teeth have simplified all the archaic mass-additive traits. But Neandertal anterior teeth, on the other hand, maintained mass-additive traits such as shovel-shaped incisors known in the fossil record since Homo erectus times and currently found at high frequencies in Asia and America. We should also learn the “Denisova lesson” that suggests that fossil evidence may not adequately capture ancient biological diversity. Left with a slim hope that any ancient DNA from Sub-Saharan Africa will ever be retrieved, we may never be able to fill in all the “missing links” and will settle for paleobiologists’ word on where all the common ancestors lived. Via Sam Hicks and SciShow.